A Wave Digital Filter (WDF)  is a particular kind of digital filter based on physical modeling principles. Unlike most digital filter types, every delay element in a WDF can be interpreted physically as holding the current state of a mass or spring (or capacitor or inductor). WDFs can also be viewed as a particular kind of finite difference scheme having unusually good numerical properties . (See Appendix D for an introduction to finite difference schemes.) WDFs have been applied often in music signal processing [394,338,556,361,348,554,555,56,527,523,484]. Wave digital filters were developed initially by Alfred Fettweis  in the late 1960s for digitizing lumped electrical circuits composed of inductors, capacitors, resistors, transformers, gyrators, circulators, and other elements of classical network theory . The WDF approach is based on the traveling-wave formulation of lumped electrical elements introduced by Belevitch . A WDF is constructed by interconnecting simple discrete-time models of individual masses, springs, and dashpots (or inductors, capacitors, and resistors). The rules for interconnecting the elementary models are based on scattering theory (discussed in §C.8). This is a direct result of the fact that all signals explicitly computed may be physically interpreted as traveling wave components of physical variables. When modeling mechanical systems composed of masses, springs, and dashpots, it is best to begin with an electrical equivalent circuit. 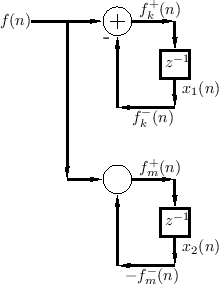 Equivalent circuits make clear the network-theoretic structure of the system, clearly indicating, for example, whether interacting elements should be connected in series or parallel. Each element of the equivalent circuit can then be replaced by a first-order wave digital element, and the elements are finally parallel or series connected by means of scattering-junction interfaces known as adaptors. First express all physical quantities (such as force and velocity) in terms of traveling-wave components. The traveling wave components are called wave variables. For example, the force on a mass is decomposed as , where is regarded as a traveling wave propagating toward the mass, while is seen as the traveling component propagating away from the mass. A ``traveling wave'' view of force mediation is actually much closer to physical reality than any instantaneous model. Second, digitize the resulting traveling-wave system using the bilinear transform. The bilinear transform is equivalent in the time domain to the trapezoidal rule for numerical integration (see §7.3.2). The next section will examine the above steps in greater detail. An important benefit of introducing wave variables prior to bilinear transformation is the elimination of delay-free loops when connecting elementary building blocks. In other words, any number of elementary models can be interconnected, in series or in parallel, and the resulting finite-difference scheme remains explicit (free of delay-free loops). To each element, such as a capacitor or inductor, attach a length of waveguide (electrical transmission line) having wave impedance , and make it infinitesimally long. (Take the limit as its length goes to zero.) A schematic depiction of this is shown in Fig.F.1a. For consistency, all signals are Laplace transforms of their respective time-domain signals. The length must approach zero in order not to introduce propagation delays into the signal path. Figure F.1: a) Physical schematic for the derivation of a wave digital model of driving-point impedance . The inserted waveguide impedance is real and positive, but otherwise arbitrary. b) Expanded view of the interior of the infinitesimal waveguide section, also representing the termination impedance as an impedance-step within the waveguide. The infinitesimal waveguide is terminated by the element. The element reflects waves as if it were a new waveguide section at impedance , as depicted in Fig.F.1b. The interface to the element is recast as traveling-wave components and at impedance . In terms of these components, the physical force on the element is obtained by adding them together: . The waveguide impedance is arbitrary because it has been physically introduced. We will need to know it when we connect this element to other elements. The element's interface to other elements is now a waveguide (transmission line) at real impedance . Force (voltage) must be continuous across the junction, since otherwise there would be a finite force across a zero mass, producing infinite acceleration. The sum of velocities (currents) into the junction must be zero by conservation of mass (charge). We now derive the reflectances of the elements used in LTI analog electric circuits, viz., the capacitor, inductor, and resistor. Note that both the capacitor and inductor reflectances are stable allpass filters, as they must be. Also, the resistor reflectance is always less than 1, no matter what waveguide impedance we choose. where is an arbitrary real constant, usually taken to be . as before in the continuous-time case. Note that this choice of is also the only one that eliminates delay-free paths in the fundamental elements. This allows them to be used as building blocks for explicit finite difference schemes. We may still obtain the above results using the more typical value (instead of ) in the bilinear transform. From Eq. (F.12), it is clear that changing amounts to a linear frequency scaling of . Such a scaling may be compensated by choosing the waveguide (port) impedances to be (instead of ) for the inductor, and (instead of ) for the capacitor. In WDF construction, the free constant in the bilinear transform is taken to be . Thus we obtain . When is first order, it is possible to choose the reference impedance so as to eliminate the delay-free path in the digital reflectance , and so its value depends on the actual physical element being digitized. Again the delay-free path has been eliminated. The wave flow diagram is shown in Fig.F.3. Figure F.3: Wave flow diagram for the Wave Digital Spring. Thus, the WDF of a spring is simply a unit-sample delay, which is just the negative of the WDF mass. If we were to switch to velocity waves instead of force waves, both masses and springs would again correspond to unit-sample delays, but the spring would become inverting and the mass non-inverting. as well. Thus, the WDF of a dashpot is a ``wave sink,'' as diagrammed in Fig.F.4. Figure F.4: Wave flow diagram for the Wave Digital Dashpot. In the context of waveguide theory, a zero reflectance corresponds to a matched impedance, i.e., the terminating transmission-line impedance equals the characteristic impedance of the line. The difference equation for the wave digital dashpot is simply . While this may appear overly degenerate at first, remember that the interface to the element is a port at impedance . Thus, in this particular case only, the infinitesimal waveguide interface is the element itself. For velocity waves, we obtain the opposite results: rigid terminations are inverting, and free terminations are non-inverting. The unit element two-port is simply a bidirectional delay line with half a sample delay in each direction. As a result, it really belongs under the topic of distributed modeling. To avoid delay-free loops, Fettweis noted  that every pair of adaptors must be separated by at least one unit element. More recently, this objective is accomplished instead using ``reflection-free ports''  (see also §F.2.2). This section first addresses the simpler two-port case, followed by a derivation of the general -port adaptor, for both parallel and series connections of wave digital elements. As discussed in §7.2, a physical connection of two or more ports can either be in parallel (forces are equal and the velocities sum to zero) or in series (velocities equal and forces sum to zero). Combinations of parallel and series connections are also of course possible. Figure F.5a illustrates a generic parallel two-port connection in terms of forces and velocities. Figure: a) Two-port description of the adaptor implementing a parallel connection between reference impedances and . b) Corresponding parallel force scattering junction (adaptor wave flow diagram) in Kelly-Lochbaum form. Compare with Fig.F.7. as diagrammed in Fig.F.5b. This can be called the Kelly-Lochbaum implementation of the two-port force-wave adaptor. Now that we have a proper scattering interface between two reference impedances, we may connect two wave digital elements together, setting to the port impedance of element 1, and to the port impedance of element 2. An example is shown in Fig.F.35. which requires only one multiplication and three additions. This can be called the one-multiply form. The one-multiply form is most efficient in custom VLSI. The Kelly-Lochbaum form, on the other hand, may be more efficient in software, and slightly faster (by one addition) in parallel hardware. Note carefully that to connect a wave digital element to port of the adaptor, we route the signal coming out of the element to become on the adaptor port, and the signal coming out of port of the adaptor goes into the element as . Such a connection is said to be a compatible port connection. In other words, the connections must be made such that the arrows go in the same direction in the wave flow diagram. we may implement , say, as in order to eliminate one multiply. In WDF terminology, port 1 is then a dependent port. Thus, the th alpha parameter is the force transmission coefficient from th port to any other port (besides the th). To convert the transmission coefficient from the th port to the reflection coefficient for that port, we simply subtract 1. This general relationship is specific to force waves at a parallel junction, as we will soon see. and the result is verified. Thus, the port's impedance must equal the parallel combination of the other port impedances at the junction. In this case, the junction as a whole ``perfectly terminates'' the reflection free port, so no reflections come back from it. Connecting two adaptors at a reflection-free port prevents the formation of a delay-free loop which would otherwise occur . As a result, multi-port junctions can be joined without having to insert unit elements (see §F.1.7) to avoid creating delay-free loops. Only one of the two ports participating in the connection needs to be reflection free. We can always make a reflection-free port at the connection of two adaptors because the ports used for this connection (one on each adaptor) were created only for purposes of this connection. They can be set to any impedance, and only one of them needs to be reflection free. To interconnect three adaptors, labeled , , and , we may proceed as follows: Let be augmented with two unconstrained ports, having impedances and . Add a reflection-free port to , and suppose its impedance has to be . Add a reflection-free port to , and suppose its impedance has to be . Now set and connect to via the corresponding ports. Similarly, set and connect to accordingly. This adaptor-connection protocol clearly extends to any number of adaptors. Figure F.6a illustrates a generic two-port description of the series adaptor. Figure F.6: a) Two-port description of the adaptor implementing a series connection between reference impedances and . b) Corresponding series force scattering junction (adaptor wave flow diagram) in Kelly-Lochbaum form. Figure F.7: Series velocity scattering junction in Kelly-Lochbaum form. so that we may implement one beta parameter as 2 minus the sum of the rest, thus eliminating a multiplication by creating a dependent port. Thus, the th beta parameter is the velocity transmission coefficient from th port to any other port (besides the th). To convert the transmission coefficient from the th port to the reflection coefficient for that port, we simply subtract 1. These relationships are specific to velocity waves at a series junction (cf. Eq. (F.22)). They are exactly the dual of Equations (F.22-F.23) for force waves at a parallel junction. That is, the port's impedance must equal the series combination of the other port impedances at the junction. This result can be compared with that for the parallel junction in §F.2.2. The series adaptor has now been derived in a way which emphasizes its duality with respect to the parallel adaptor. This section presents a series of examples, working up from very simple to more complicated situations. Suppose we wish to model a situation in which a mass of size kilograms is traveling with a constant velocity. This is an appropriate model for a piano hammer after its key has been pressed and before the hammer has reached the string. Figure F.2 shows the ``wave digital mass'' derived previously. The derivation consisted of inserting an infinitesimal waveguideF.3 having (real) impedance , solving for the force-wave reflectance of the mass as seen from the waveguide, and then mapping it to the discrete time domain using the bilinear transform. We now need to attach the other end of the transmission line to a ``force source'' which applies a force of zero newtons to the mass. In other words, we need to terminate the line in a way that corresponds to zero force. The zero-force case is therefore obtained when . This is illustrated in Fig.F.8. Figure F.8: Wave digital mass in flight at a constant velocity. Figure F.8a (left portion) illustrates what we derived by physical reasoning, and as such, it is most appropriate as a physical model of the constant-velocity mass. However, for actual implementation, Fig.F.8b would be more typical in practice. This is because we can always negate the state variable if needed to convert it from to . It is very common to see final simplifications like this to maximize efficiency. Note that Fig.F.8b can be interpreted physically as a wave digital spring displaced by a constant force . where here, it is easy to convert the state variable to other physical units, as we now demonstrate. Thus, the state variable can be scaled by to ``read out'' the mass velocity. I.e., the square of the state variable can be scaled by to produce the physical kinetic energy associated with the mass. Since and are given, must be computed as . This is shown in Fig.F.9. Figure F.9: Wave digital mass driven by external force . The simplified form in Fig.F.9b can be interpreted as a wave digital spring with applied force delivered from an infinite source impedance. That is, when the applied force goes to zero, the termination remains rigid at the current displacement. Above we derived how to handle the external force by direct physical reasoning. In this section, we'll derive it using a more general step-by-step procedure which can be applied systematically to more complicated situations. Figure F.10 gives the physical picture of a free mass driven by an external force in one dimension. Figure F.11 shows the electrical equivalent circuit for this scenario in which the external force is represented by a voltage source emitting volts, and the mass is modeled by an inductor having the value Henrys. Figure F.10: Physical diagram of an external force driving a mass sliding on a frictionless surface. Figure: Electrical equivalent circuit of the force-driven mass in Fig.F.10. The next step is to convert the voltages and currents in the electrical equivalent circuit to wave variables. Figure F.12 gives an intermediate equivalent circuit in which an infinitesimal transmission line section with real impedance has been inserted to facilitate the computation of the wave-variable reflectance, as we did in §F.1.1 to derive Eq. (F.1). 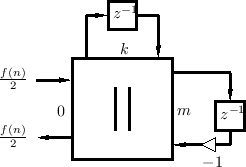 Figure F.12: Intermediate equivalent circuit for the force-driven mass in which an infinitesimal transmission line section has been inserted to facilitate conversion of the mass impedance into a wave-variable reflectance. Figure: Intermediate wave-variable model of the force-driven mass of Fig.F.11. Figure F.13 depicts a next intermediate equivalent circuit in which the mass has been replaced by its reflectance (using `` '' to denote the continuous-time reflectance , as derived in §F.1.1). The infinitesimal transmission-line section is now represented by a ``resistor'' since, when the voltage source is initially ``switched on'', it only ``sees'' a real resistance having the value Ohms (the waveguide interface). After a short period of time determined by the reflectance of the mass,F.4 ``return waves'' from the mass result in an ultimately reactive impedance. This of course must be the case because the mass does not dissipate energy. Therefore, the ``resistor'' of Ohms is not a resistor in the usual sense since it does not convert potential energy (the voltage drop across it) into heat. Instead, it converts potential energy into propagating waves with 100% efficiency. Since all of this wave energy is ultimately reflected by the terminating element (mass, spring, or any combination of masses and springs), the net effect is a purely reactive impedance, as we know it must be. Figure F.14: Interconnection of the wave digital mass with an ideal force source by means of a two-port parallel adaptor. The symbol `` '' is used in the WDF literature to signify a parallel adaptor. Since and for this model, the reflection coefficient seen on port 1 is . 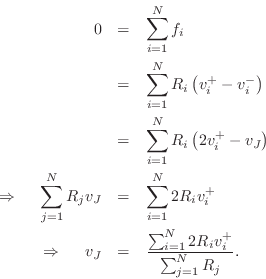 The transmission coefficient from port 1 is . In the opposite direction, the reflection coefficient on port 2 is , and the transmission coefficient from port 2 is . The final result, drawn in Kelly-Lochbaum form (see §F.2.1), is diagrammed in Fig.F.15, as well as the result of some elementary simplifications. The final model is the same as in Fig.F.9, as it should be. Figure F.15: Wave digital mass driven by external force . For this example, we have an external force driving a spring which is terminated on the other end at a rigid wall. Figure F.16 shows the physical diagram and the electrical equivalent circuit is given in Fig.F.17. Figure F.16: External force driving a spring terminated by a rigid wall. Figure: Electrical equivalent circuit of the compressed spring of Fig.F.16. Figure F.18 depicts the insertion of an infinitesimal transmission line, and Fig.F.19 shows the result of converting the spring impedance to wave variable form. Figure F.18: Intermediate equivalent circuit for the force-driven spring in which an infinitesimal transmission line section has been inserted to facilitate conversion of the spring impedance into a wave-variable reflectance. Figure: Intermediate wave-variable model of Fig.F.17. The two-port adaptor needed for this problem is the same as that for the force-driven mass, and the final result is shown in Fig.F.20. Figure F.20: Wave digital spring driven by external force . Note that the spring model is being driven by a force from a zero source impedance, in contrast with the infinite source impedance interpretation of Fig.F.8b as a compressed spring. In this case, if the driving force goes to zero, the spring force goes immediately to zero (``free termination'') rather than remaining fixed. For this example, we have an external force driving a spring which in turn drives a free mass . Since the force on the spring and the mass are always the same, they are formally ``parallel'' impedances. This problem is easier than it may first appear since an ideal ``force source'' (i.e., one with a zero source impedance) driving impedances in parallel can be analyzed separately for each parallel branch. That is, the system is equivalent to one in which the mass and spring are not connected at all, and each has its own copy of the force source. With this insight in mind, one can immediately write down the final wave-digital model shown in Fig.F.25. However, we will go ahead and analyze this case more formally since it has some interesting features. Figure F.21 shows the physical diagram of the spring-mass system driven by an external force. The electrical equivalent circuit appears in Fig.F.22, and the first stage of a wave-variable conversion is shown in Fig.F.23. Figure F.21: External force driving a spring which in turn drives a free mass sliding on a frictionless surface. Figure: Electrical equivalent circuit of the spring/mass system of Fig.F.21. Figure: Intermediate wave-variable model of the mass and dashpot of Fig.F.22. Figure F.24: Wave digital model for the parallel combination of a wave digital mass , wave digital spring , and driving force . The corresponding port impedances are , , and 0, respectively. For this example we need a three-port parallel adaptor, as shown in Fig.F.24 (along with its attached mass and spring). The port impedances are 0, , and , yielding alpha parameters and . The final result, after the same sorts of elementary simplifications as in the previous example, is shown in Fig.F.25. As predicted, a force source driving elements in parallel is equivalent to a set of independent force-driven elements. 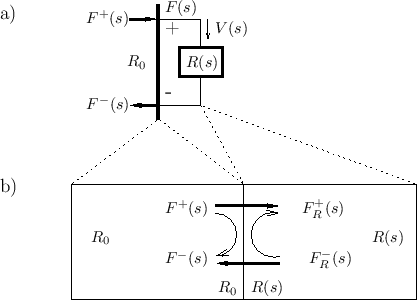 Figure F.25: Wave digital filter model of an external force driving a mass through a spring. The mass force-wave components are denoted , while those for the spring are denoted . From this and the preceding example, we can see a general pattern: Whenever there is an ideal force source driving a parallel junction, then and all other port admittances are finite. In this case, we always obtain and , . This is our first example illustrating a series connection of wave digital elements. 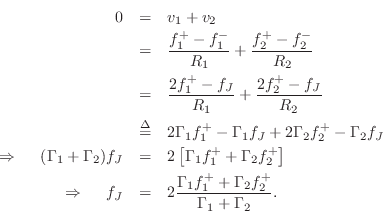 Figure F.26 gives the physical scenario of a simple mass-dashpot system, and Fig.F.27 shows the equivalent circuit. Replacing element voltages and currents in the equivalent circuit by wave variables in an infinitesimal waveguides produces Fig.F.28. Figure F.26: External force driving a mass which in turn drives a dashpot terminated on the other end by a rigid wall. Figure: Electrical equivalent circuit of the mass and dashpot system of Fig.F.26. Figure: Intermediate wave-variable model of the mass and dashpot of Fig.F.27. Figure F.29: Wave digital filter for an ideal force source in parallel with the series combination of a mass and dashpot . The parallel and series adaptors are joined at an impedance which is calculated to suppress reflection from port 1 of the series adaptor. The system can be described as an ideal force source connected in parallel with the series connection of mass and dashpot . Figure F.29 illustrates the resulting wave digital filter. Note that the ports are now numbered for reference. Two more symbols are introduced in this figure: (1) the horizontal line with a dot in the middle indicating a series adaptor, and (2) the indication of a reflection-free port on input 1 of the series adaptor (signal ). Recall that a reflection-free port is always necessary when connecting two adaptors together, to avoid creating a delay-free loop. That is, the impedance of the reflection-free port must equal the series combination of all other port impedances meeting at the junction. Therefore, the reflection coefficient seen at port 1 of the parallel adaptor is , and the Kelly-Lochbaum scattering junction depicted in Fig.F.20 is verified. We do not need to explicitly compute because it goes into a purely resistive impedance and produces no return wave. For the same reason, . Figure F.30 shows a wave flow diagram of the computations derived, together with the result of elementary simplifications. Figure F.30: Wave flow diagram for the WDF modeling an ideal force source in parallel with the series combination of a mass and dashpot . Because the difference of the two coefficients in Fig.F.30 is 1, we can easily derive the one-multiply form in Fig.F.31. Figure: One-multiply form of the WDF in Fig.F.30. Let's check our result by comparing the transfer function from the input force to the force on the mass in both the discrete- and continuous-time cases. Thus, we have verified that the force transfer-function from the driving force to the mass is identical in the discrete- and continuous-time models, except for the bilinear transform frequency warping in the discrete-time case. Let's look again at the mass-spring oscillator of §F.3.4, but this time without the driving force (which effectively decouples the mass and spring into separate first-order systems). The physical diagram and equivalent circuit are shown in Fig.F.32 and Fig.F.33, respectively. Figure F.32: Elementary mass-spring oscillator. Figure F.33: Equivalent circuit for the mass-spring oscillator. This result, , is just the ``impedance step over impedance sum'', so no calculation was really necessary. Figure F.34: Wave digital mass-spring oscillator. Figure F.35: Detailed wave-flow diagram for the wave digital mass-spring oscillator. Since the poles are on the axis, there is no damping, as we expect. We see that dc ( ) corresponds to , and corresponds to . Since the spring and mass are connected in parallel, it must be the true that they are subjected to the same physical force at all times. Comparing Equations (F.41-F.43) verifies this to be the case. which agrees with the spring, as it must. It may seem disturbing that such a simple, passive, physically rigorous simulation of a mass-spring oscillator should have to make use of state variables which grow without bound for the limiting cases of simple harmonic motion at frequencies zero and half the sampling rate. This is obviously a valid concern in practice as well. However, it is easy to show that this only happens at dc and , and that there is a true degeneracy at these frequencies, even in the physics. For all frequencies in the audio range (e.g., for typical sampling rates), such state variable growth cannot occur. Let's take closer look at this phenomenon, first from a signal processing point of view, and second from a physical point of view. Going back to the poles of the mass-spring system in Eq. (F.39), we see that, as the imaginary part of the two poles, , approach zero, they come together at to create a repeated pole. The same thing happens at since both poles go to ``the point at infinity''. It is a well known fact from linear systems theory that two poles at the same point in the plane can correspond to an impulse-response component of the form , in addition to the component produced by a single pole at . In the discrete-time case, a double pole at can give rise to an impulse-response component of the form . This is the fundamental source of the linearly growing internal states of the wave digital sine oscillator at dc and . It is interesting to note, however, that such modes are always unobservable at any physical output such as the mass force or spring force that is not actually linearly growing. The dc term is therefore accompanied by a linearly growing term in the physical mass velocity. It is therefore unavoidable that we have some means of producing an unbounded, linearly growing output variable. To approach the limit of , we must either take the spring constant to zero, or the mass to infinity, or both. In the case of , the mass becomes unaffected by the spring force, so its final velocity must be zero. Otherwise, the attached spring would keep compressing or stretching forever, and this would take infinite energy. (Another way to arrive at this conclusion is to note that the final kinetic energy of the mass would be .) Since the total energy in an undriven mass-spring oscillator is always constant, the infinite-mass limit must be accompanied by a zero-velocity limit.F.6 This means the mass's state variable in Fig.F.35 must be forced to zero in the limit so that there will be no linearly growing solution at dc. In summary, when two or more system poles approach each other to form a repeated pole, care must be taken to ensure that the limit is approached in a physically meaningful way. In the case of the mass-spring oscillator, for example, any change in the spring constant or mass must be accompanied by the physically appropriate change in the state variables and/or . It is obviously incorrect, for example, to suddenly set in the simulation without simultaneously clearing the spring's state variable , since the force across an infinitely compliant spring can only be zero. Similar remarks apply to repeated poles corresponding to . In this case, the mass and spring basically change places. In a velocity-wave simulation, displacement is the integral of velocity. Therefore, the energy-conserving velocity correction is impulsive in this case. 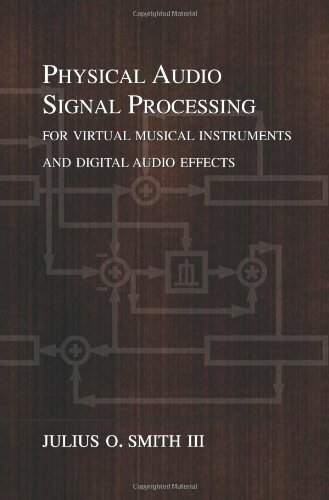 Comparing digital and analog frequency formulas. This first exercise verifies that the elementary ``tank circuit'' always resonates at exactly the frequency it should, according to the bilinear transform frequency mapping , where denotes ``analog frequency'' and denotes ``digital frequency''. Find the poles of Fig.F.35 in terms of . where denotes the sampling rate. Recall that the mass-spring oscillator resonates at . Relate these two resonance frequency formulas via the analog-digital frequency map .